To Defeat The Enemy, The United States Is Helping Iraqis Rebuild. Over the course of this war, the Coalition has learned that winning the battle for Iraqi cities is only a first step. The Coalition has adjusted to win the “battle after the battle” by helping Iraqis consolidate their gains and keep the terrorists from returning. Iraqi Forces Are Securing Cities, Allowing For Targeted Reconstruction. Iraqi And Coalition Forces Have Cleared And Are Holding The Holy City Of Najaf and Mosul, two former trouble spots have made significant progress. The United States Is Working With Iraq’s Leaders To Build A Sound Economy That Will Deliver A Better Life For Iraqis. Reconstruction Efforts Are Focused On Local Projects That Deliver Rapid And Noticeable Improvements. The Coalition’s approach to helping Iraqis rebuild has changed and improved with time. When the reconstruction process was first begun in the spring of 2003, the focus was on building large-scale infrastructure – such as electrical plants and water treatment facilities. This approach was not meeting the priorities of the Iraqi people. In many places, the most urgent needs were smaller, localized projects like sewer lines and city roads. In consultation with the Iraqi government, resources started to be used to fund smaller, local projects that could deliver rapid, noticeable improvements. Together, Iraqis And Americans Are Making Progress. Reconstruction has not always gone as well as hoped – primarily because of the security challenges. Rebuilding a nation devastated by a dictator is a large undertaking – even harder when terrorists attempt to destroy gains. 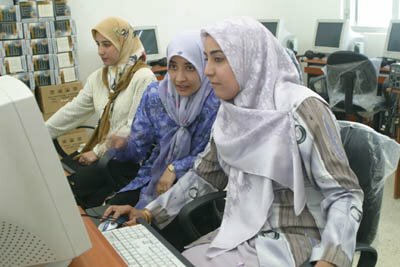 Yet, in the space of two and a half years, the United States has helped Iraqis conduct nearly 3,000 renovation projects at schools, train more than 30,000 teachers, distribute more than 8 million textbooks, rebuild irrigation infrastructure to help more than 400,000 rural Iraqis, and improve drinking water for more than 3 million people. The Coalition has helped Iraqis introduce a new currency, reopen their stock exchange, and extend $21 million in micro-credit and small business loans. As a result of these efforts and Iraq’s newfound freedom, more than 30,000 new Iraqi businesses have registered since liberation, and according to a recent survey, more than three-quarters of Iraqi business owners anticipate growth in the economy over the next two years. This economic development and growth will be key to addressing the high unemployment rate across many parts of the country. In addition, Iraqis have negotiated significant debt relief and completed an economic report card with the International Monetary Fund – a signal that Iraqis are serious about reform. The United States Will Settle For Nothing Less Than Complete Victory In Iraq. Withdrawing on an artificial deadline would endanger the American people, harm our military, and make the Middle East less stable. It would also give the terrorists exactly what they want. Building Democracy In Iraq Will Establish A Peaceful Civil Society That Is An Ally In The War On Terror. Free societies are peaceful societies, and democracies do not attack each other. Free nations give their citizens a path to resolve their differences peacefully through the democratic process. Democracy can be difficult, complicated, and even chaotic. Iraqis have to overcome many challenges, including longstanding ethnic and religious tensions, and the legacy of decades of brutal repression. But they are learning that democracy is the only way to build a just and peaceful society – because it is the only system that gives every citizen a voice in determining their future. After a caucus meeting on Iraq, she and other Democrats in leadership sought to project a unified front on the war, even though they disagree over just when U.S. troops should return home. Senate Democratic leader Harry Reid, D-Nev., said Bush failed to provide a strategy for success or speak honestly about the failures in rebuilding Iraq and the challenges ahead. “Instead, he cherry picked isolated examples of Iraq’s reconstruction from two cities that provide an inaccurate and incomplete picture of the situation on the ground for most Iraqis,” Reid said. The Democrats are wanting to appear unified on Iraq, but are having their difficulties. They have members who are pushing the “cut and run” approach, members who want to stay the war to its completion and those who want to start another advisory group for the president. With their constant negativity on, well just about everything, they can probably expect more backlash at the polls, especially as the public is made aware of the truth about the booming economy and the tremendous, historic progress in Iraq. Will US Now Abandon the Hopes & Progress of Iraq? Update: (Wednesday, 12-7 PM) I’m with Austin Bay… Tsk, Tsk, the Bush Administration needed and needs to do more of this.